Hip-hop sensation 3OH!3 will be the headline band for an April 22 concert at the University of Colorado at Colorado Springs. The show begins at 7 p.m. at Mountain Lion Stadium on North Nevada Avenue. Year Seven, winner of the UCCS student Battle of the Bands, will open, followed by Chain Gang of 1974, K.Flay and Boulder-based 3OH!3. 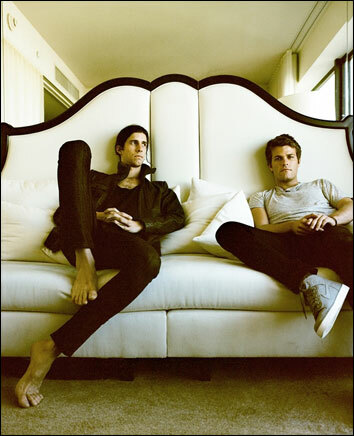 Led by Sean Foreman and Nathaniel Motte, who met as students at the University of Colorado at Boulder, 3OH!3 released its first recording in July 2008. The band has opened several Snoop Dogg concerts, played the Denver leg of the Warped Tour in 2007 and 2008, and national festivals such as Bamboozle Left and Pemberton Festival in British Columbia, Canada. The group's best-known song is "Don't Trust Me." The concert is sponsored by the UCCS Office of Student Activities and is part of Alcohol Abuse Awareness Month at UCCS. Alcohol will not be allowed at the concert. Tickets for UCCS students, faculty and staff are $15. Students from other local colleges may purchase tickets for $20; general admission tickets are $25. For more information, visit www.uccs.edu/osa or contact Mitch Karstens, 719-255-3540.